Tokyo, Japan, November 12 2018: Kitty Wong, president of K&A International Co. Ltd. and Immediate Past President of the World PCO Alliance, has been awarded an Inspirational ICCA Woman award. The awards, a project initiated by Nina Freysen-Pretorius, ICCA’s Immediate Past President (also an Alliance partner), were presented by the newly elected ICCA President, James Rees, at the President’s Choice session, held on November 12, 2018 as part of the 57th ICCA Congress. The awards celebrate the achievements by women who embody the principles and values that are central to ICCA. Ms. Wong was one of ten women recognized and the only representative from Asia. A meetings professional since 1991, Kitty Wong is one of the most celebrated and influential figures in the Meetings, Incentives, Conferences and Events (MICE) industry. In addition to being president of K&A International Co. Ltd., a company she founded in 1995, she’s also vice-president of the Taiwan Exhibition and Convention Association (TECA), a board member of the Asian Federation of Exhibition and Convention Association (AFECA), and a senior consultant for the MEETTAIWAN Project (2017-2020). She is one of the founders of the World PCO Alliance and is the organization’s Immediate Past President. 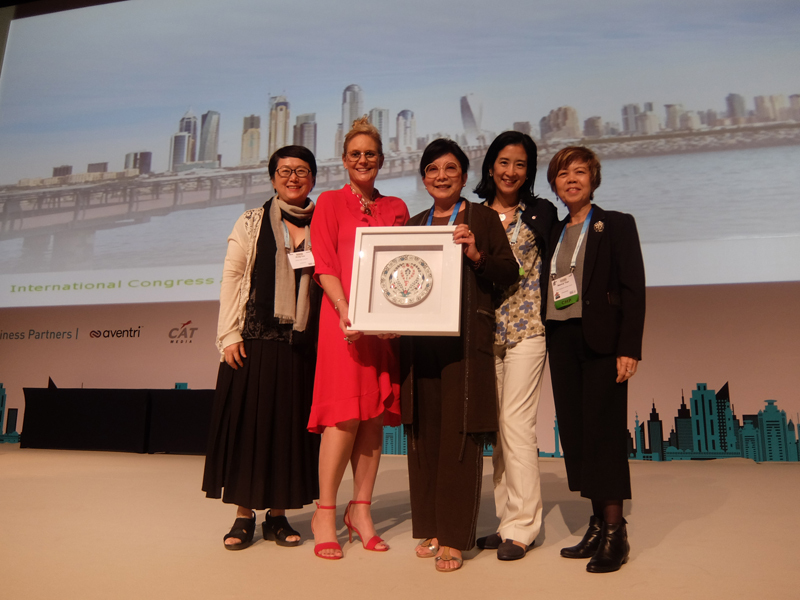 Kitty Wong with Nina Freysen-Pretorius, Immediate Past President of ICCA and other Alliance members; from left: Liu Ping, Kayo Nomura, also an IAPCO Council member, and Nancy Tan, Treasurer of the World PCO Alliance.